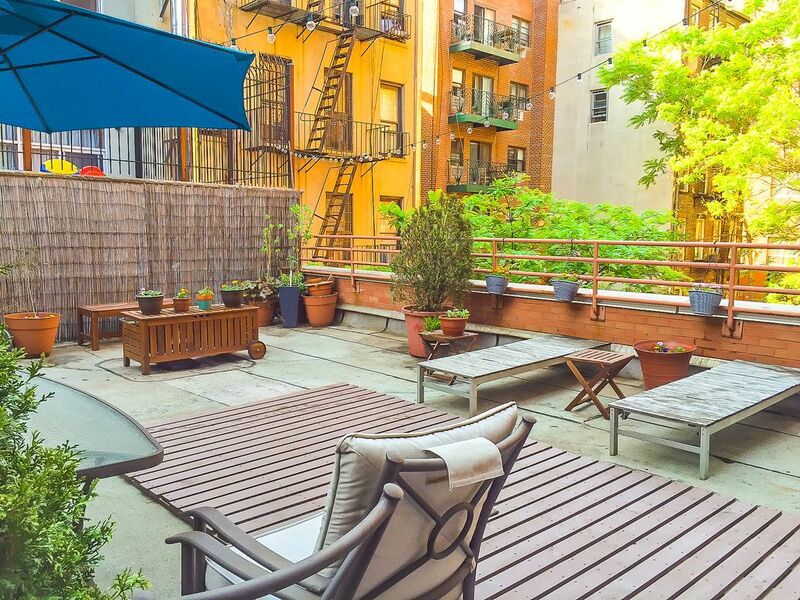 INCREDIBLE 2br with HUGE PRIVATE TERRACE in Elev Bldg! Perfect Location!!! This large beautiful 2br with large private terrace is simply fantastic. The apartment features hard wood floors and a fully equipped kitchen. The master bedroom has a queen sized bed, dresser and full length mirror. The living room has a pull out sofa as well as a large flat screen with cable TV and playstation. The second bedroom has a queen sized bed, chair, and dresser. The large terrace is perfect for getting a breath of fresh air. As for the building... it is a newish (2007) elevator building located on a quiet street and is close to everything! (you can hang out in the lower east side (0-5 min walk)... you can shop in soho. (5-8 min walk).. you can have dinner in little italy (5 min walk)... you can have brunch in the east village (5-10 min walk)... you can have authentic chinese food in china town (5 min walk)...plus there are several subways within a 3-5 min walk so it is easy to get around the city (F/M/B/D/J/Z/6 lines)... The bottom line is this apartment is far better than a tiny hotel room for less money. Come stay here...I promise, you will be happy that you did. • Beautiful, large brand new 2 bedroom Apartment . ****The apartment will be professionally cleaned and spotless upon your arrival. Neighborhood is extraordinarily hip and fun. • Very quiet block—residential, churches, community center. We had a great time with the family at this location close to Chinatown and little Italy away from touristy parts of town. It is a less than 20 min subway ride to downtown walk st WTC etc and the same to uptown Central Park. Two queens and an air mattress slept my wife and I and four kids comfortably. Clean cozy Manhattan apartment with a nice terrace. It came as advertised but was lacking in a few areas. Area was convenient. Subways are close by. Good restaurants within walking distance. Directions were clear and keys were easy to pick up. Lacking in cooking supplies. Towels were stained. Overall a good stay. rating. Clean and the extra room allowed us to bring his niece with her own privacy. Great apartment in the lower east side! Could not ask for more! Great stay and will be returning. Thanks Mike!!! This was the perfect place for a girls weekend. While not huge, it was just big enough for the 4 of us to spread out. Located very close to several subway entrances, it was very convenient. Mike’s place is just wonderful. My wife, youngest son and I came to spend Thanksgiving in the city and with our oldest son. The apartment fit the three of us well. Great location within walking distance to so many great places. WE will stay again!